Every morning, the fine folks at Sports Radio Interviews sift through the a.m. drive-time chatter to bring you the best interviews with coaches, players, and personalities across the sports landscape. Today: Schill's never been afraid to speak his mind. 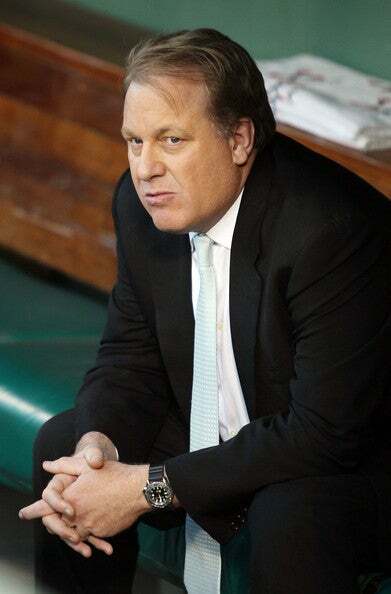 Curt Schilling joined WEEI in Boston with Dennis and Callahan to discuss how the Boston Globe article on the Red Sox collapse made him sick to his stomach, the shots taken at Terry Francona in the article, being disturbed by members of the Red Sox organization calling out Francona in the press like this, what ownership gains by leaking embarrassing info about the Red Sox to the press, being convinced that ownership gave this material to the Boston Globe, speaking with Francona about the article, being disappointed by Josh Beckett, the Red Sox being branded as quitters, David Ortiz and Jason Varitek not being true leaders of the team and the Red Sox having to trade Josh Beckett and John Lackey now after this article came out. Did the Boston Globe article on the Red Sox collapse nauseate you? Did it trouble you? Did it disappoint you? How would you describe your feelings? "All the above. You see somebody's personal life made a story and you see the reporter not use good judgement. You see the reporter do things that are probably questionable ethically. And then you see the reporter report things that you just know are true and you just wish people didn't know." Was that your reaction to the revelations (addiction to pain pills and marital issues) about Terry Francona? "Of all the things that I heard and saw talked about after it came out yesterday, did anyone put marital problems with struggling managing and bad September together? I just feel like that was one of those, ‘We need some people to buy this copy so let's put it in there.' Why? The medication, that's embarrassing and it's sad and it has nothing to do with anything because that same writer and all the people involved have been around Tito, and there were no incidents of him being off his rocker or out of it. And 30 days before that article and the season ended, everyone was okay with everything." Isn't it more disturbing that somebody within the organization felt the need to say those things about Tito? "Way more disturbing. Listen, the article bothered me and how it was written bothered me. But that's not the problem. The problem is that the article didn't lie enough for me. That happens. I know I can picture teammates, I can picture situations where everything talked about in that article, I can see or I've done. At the end of the day, that is when someone that's wealthy, someone that's powerful gets wronged, this is what happens. They destroy people's lives because they can." Why would ownership have leaked this information when they have nothing to gain from it? "In fact, there was nothing but downside to it. I think the problem there is that you're using a logical train of thought in an illogical situation. People do irrational things for the dumbest of reasons. I think when Terry got done and didn't throw anybody under the bus, I think some people in the organization were livid because the fans were pissed at the owners. I think for the most part, fans were ready for a change managerially. I hate to say it, but I think that there were a lot of fans who saying he was a great guy, but it was time. These fans want a winning baseball team. I think that everybody was semi-okay with how it ended, but they were ready to move on. After he took the high road, I think the ownership, I think there are a group of people who are very upset about the fact that he made them look bad. Because if Terry comes on and says, ‘This guy did this,' if he does throw guys under the bus, it's very easy for them to say, ‘That's why. This is why we had to do what we did.' "
Are you convinced this came from ownership in terms of the information the Boston Globe was able to obtain? "Part of this did. Absolutely. There's no way it couldn't have." Have you talked to Francona? Do you think he would be upset about the Boston Globe article? "He's upset. You guys know me. I would have acted irrationally and overreacted, I'm sure. I wonder legally whether he has recourse because the team trainer, the team doctor and the ownership, the executive people on this team I would imagine are the only people with enough knowledge of Tito's medicinal habits to make that comment, to have that news out there. This was somebody out to ruin this guy's life. Because now, I look at this almost like I look at a sexual harassment case. It doesn't matter if he did it or not. He's going to have to answer questions about this for the rest of his life." You've never failed to sing the praises of Josh Beckett. I'm guessing you're slightly disappointed in the man now that we found out how he reacted down the stretch here? "I think beyond slightly would be a good guess. I've talked to enough people to know that it's not lies. I think that the loss of [former pitching coach] John Farrell had a massive amount to do with why this all happened. I spoke to him the other day and the first thing I said to him was ‘Wow. I don't see any of this happening if you stay.' And he was like, ‘Well, it might have happened, but there would have been a couple of fist-fights along the way and I would have been gone at some point.' Poor Curt Young because here's a guy coming in to a veteran staff trying to get to know his pitchers and they – the amount of disrespect that the players involved here showed to each other, to the organization, to Tito, to the game, is staggering to me. Probably as staggering are some of the names that are on that list. I'm blown away. I'm incredibly disappointed. Things have changed here for a long, long time, and I think it's for the worse. I think the way that this was handled by the organization is pathetic and embarrassing. Why would you want to root for this team?" As painful as losing is in September and the way they lost and being branded a loser, it would seem to me the only thing worse to be branded as would be a quitter, and yet it seems like that's what we're talking about? "You're a quitting loser. Listen. Let's fast forward to Opening Day. Things have changed. They get a new manager and GM. This could be the most abysmal Opening Day in the history of sports. These guys are going to get booed. They are going to get booed. No matter what they say in the winter-time, can you imagine John Lackey jogging onto that field? [Or Beckett] But I'm saying, John is going to get a Yankee-like reception. My biggest fear is that one or more players is going to come out and try to defend what's happened instead of just doing a mea culpa and saying, ‘You know what? Wow was this wrong. Wow did we screw this guy. Wow did we cost you. I don't know if there's anything we can say or do to make this up, but we'll do everything.' I don't see anything other than that. Otherwise you can't come back." Didn't we see David Ortiz and Jason Varitek as team leaders? Do you have any theories as to where they were in all of this? Why didn't they stop it? "They've never been those guys. Those guys were accessory leaders. And Jason was one of those guys who would ask me to have a meeting. Here's what, we need to do this. He was not comfortable for the most part standing up and talking every night. And it's not a bad thing. He just figured, I'd play hard and everybody would follow suit. And if not, I'd have to talk with the person that didn't. David's not that guy. David is a guy in the clubhouse with some leaders that can help. David, he's a designated hitter. God bless him. I love him to death. But David is an emotional guy. He tends to swing way high or way low based on how he's swinging the bat. And guys want to be led by guys who it doesn't matter what you're hitting." Do you think the Red Sox will explore trading Josh Beckett? We know they're looking at trading John Lackey, but that's going to be a tough pill to swallow? "I don't know that they have a choice. I can't envision a scenario where he's back here." • Kevin Love loves his Trapper Keeper. • Dana White calls Canada the Mecca of MMA. • Bernard Hopkins is old.